Description: This electronic keyboard makes learning piano both fun and portable (keyboard features a carry handle)! The keyboard has record and playback buttons, and a "correct" button that makes editing mistakes a snap. Requires four C-size batteries (not included). An AC adapter jack is included. Designed for children ages 5 years and older. FPT45217 - White electronic keyboard that has piano sounds and full size piano keys. The keyboard has record and playback buttons, and a "correct" button that makes editing mistakes a snap. This piano has an automatic shut-off to conserve batteries. Requires four C-size batteries (not included). 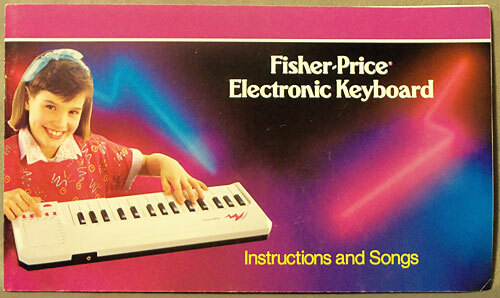 In 1989, this was called "Fisher-Price Electronic Keyboard". In 1990, this was called "Real Sounds Piano". This was sold in a 24-3/8" long, 13-1/8" high, 2-3/8" deep box. 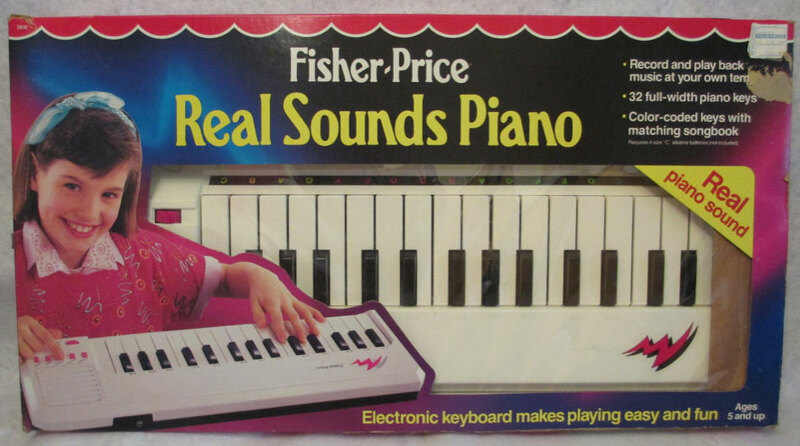 FP3810SET1989 - Keyboard with original box (NO ADAPTER NOR SONGBOOK). WFL: BW.